NBA players Javale McGee and Andray Blatche may play for Gilas Pilipinas - Balita Boss! The Philippine national men’s basketball team also known as Gilas Pilipinas is now looking at National Basketball Association (NBA) players Javale McGee and Andray Blatche to be put in a pool of naturalized players for the preparation of 2014 FIBA World Cup. Gilas Pilipinas head coach Chot Reyes made a splash on Thursday, January 30 as he announced that bills have been filed for the naturalization of the two possible reinforcement players from the NBA, McGee and Blatche. Samahang Basketbol ng Pilipinas President Manuel V. Pangilinan tweeted also about McGee and Blatche. News: two NBA players may join Gilas Team. Javale Mcgee, Denver Nuggets. Andray Blatche, Brooklyn Nets. Go Gilas! House Bill No. 3783 for Blatche and House Bill No. 3784 for McGee have already been filed in the House of Representatives. Both bills will take care of giving citizenship for both players, filed by Antipolo City representative Robbie Puno. “We need to naturalize at least two players who will be eligible to play for the Philippine team. Although only one will be included in the final line up, it is good to have two players to avoid jeopardizing the entire basketball program in the event of an injury to any of our naturalized players,” said Puno in a press release. McGee has long been eyed for naturalization, but the House Bill No. 6169 back in May 2012, a bill to naturalize the then-restricted free agent did not materialize because of the issue about insurance requirements. A center for the Denver Nuggets, McGee is currently sidelined due to a left tibia stress fracture. Blatche on the other hand is a backup center for All Star Brook Lopez, for the Brooklyn Nets. He is now averaging 12.1 points and 6 rebounds in 39 games this ongoing NBA 2013-14 Regular Season. 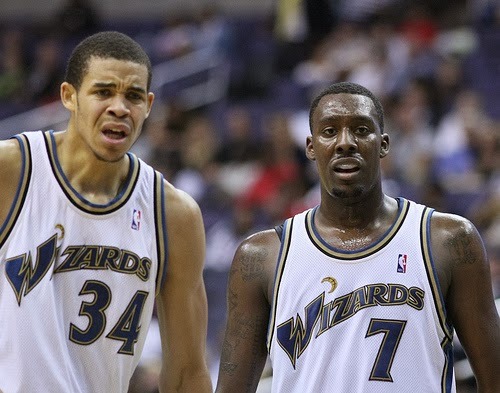 McGee and Blatche were teammates in Washington Wizards from 2008 to 2012. Congressman Puno was also behind the bill responsible for the naturalization of 6-foot-10 center Marcus Douthit. The 33-year-old center played for Gilas Pilipinas in the past years.